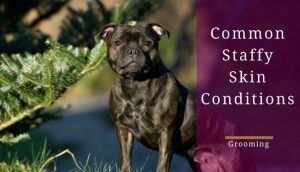 As a medium to larger-sized breed, arthritis could be a potential problem for staffies; out of the common staffy health problems, hip joint issues are up there. This means it’s important for you take precautions to keep their joints healthy. 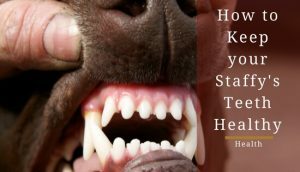 In fact, it’s important to start taking these precautions during the puppy years to increase the likelihood your staffy won't encounter joint problems in the future. After all, you don’t want your staffy to have problems getting up the stairs in their later years; it’s a truly heartbreaking experience to witness. 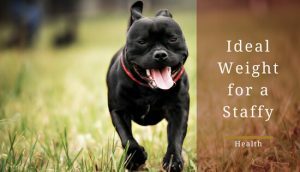 To keep your staffy free of these issues, I’m going to provide you with the action steps you can take to help your dog avoid joint problems. It’s important to give your staffy regular exercise for a lot of reasons, but one of the most important is to keep their joints active, strong and healthy. Joint issues are likely to get worse if your staffy isn't moving around as much. Now, for some staffies, walks outside in the summer months can be a tough task depending on their joint health. 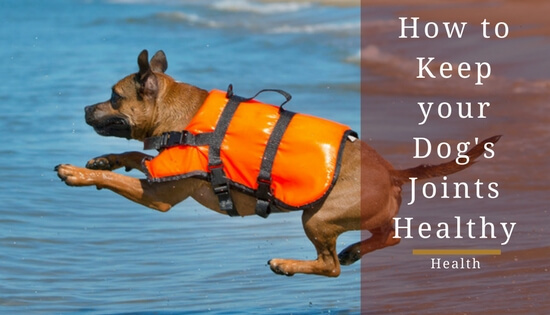 Luckily, they’re other forms of exercise like swimming or even underwater treadmills, which are available as a form of physiotherapy and help to reduce the pressure on your staffy’s joints. In fact, swimming provides little to no pressure on your staffy’s joints. Staffies aren't known for being the strongest swimmers so take it slow; a 20-minute session is equal to the amount of exercise they’d get on a run. Therefore, if you can find a safe place for a swim or an underwater treadmill facility, try to take your staffy there and let him/her get some much-needed exercise without worrying about their joints. Slippery floors can very problematic for a staffy’s joints through the possibility of them skidding across the floor. There’s an easy way to counteract this by investing in some rugs. Unfortunately, as most dog owners know, having rugs around the house can be a real hassle for younger dogs because it makes it harder to clean up their messes. On the other hand, rugs are much easier on your staffy’s joints than a hardwood floor or something slick like laminate flooring; you don’t want your staffy skidding across the floor when running into the kitchen for a treat. Placing rugs around your house will limit your staffy’s exposure to dangerous surfaces that could end up hurting their joints. If at all possible, invest in some carpeting where you can. It will completely eliminate the risk a hardwood floor presents to your dog. At the end of the day, you want your staffy to be as comfortable as possible. A healthy diet could do wonders for your staffy’s joints; simply, because it reduces the chance they’ll be overweight. As with humans, being overweight puts more pressure on the joints and makes it more painful for your staffy to exercise. 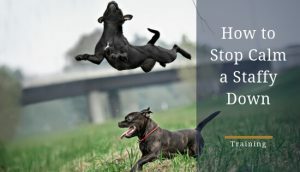 In a sense, it ends up being a cycle that your staffy can’t recover from because being overweight makes it almost impossible for them to move without pain. After all, you’re going to need them to exercise to lose weight. Therefore, it’s extremely important to feed your staffy the right kind of food and the right amount of food from the beginning. 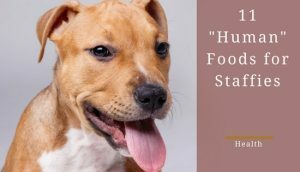 Check out our article on the best dog food for staffies to find a high-quality, healthy food for your pup. 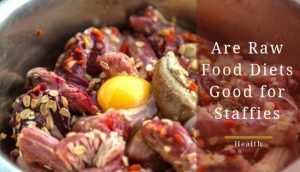 Of course, you should consult a vet on what’s the best food and the right amount to feed your staffy. This might sound a bit unusual to some but, just like humans, your staffy loves massages and it can help relieve their joint pain. So, after a long walk or any kind of exercise, gently massage their joints, while, petting them. Not only will it relieve their pain, but also, the bond between you and your staffy will only continue to grow. Petting releases the hormone oxytocin that causes the feeling of love, therefore, bonding them more with you. You can also use a heat pad like this one to reduce the stiffness in your staffy’s joints. It will increase your dog's blood circulation and release the tension. Honestly, it’s just another excuse to pet your beloved staffy, so, take advantage of this and spend more time with them. As mentioned before, slippery floors can be a real nuisance for your staffy. A way to counteract the effect these types of floors have on your staffy is through keeping their nails the proper length. The proper nail length is letting them just touch the floor, anything else can provide a high risk for joint problems. It will give them fewer opportunities to slip and push their joints to their limit. For some owners, cutting their dog's nails can be one of the worst experiences; some dogs tend to yelp or the owner just can’t bring himself or herself to do it. In this case, find a professional dog groomer to cut your staffy’s nails for you. 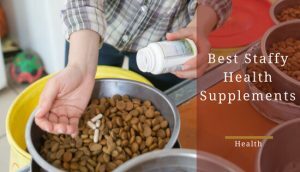 The idea is that these supplements work in conjunction with your staffy’s diet to enhance joint function and build a defense against later joint pain issues. 1. Yumove supplement for stiff and older dogs - Extremely popular! over 4000 reviews. Although their marketing points it towards older dogs, the ingredients will work for any dog but there is a version for younger dogs as well. 2. Seraquin chewable tablets - Recommended by vets to improve joint function and can be used as part of your dogs daily diet regime for life. Please note, it’s extremely important to consult with a vet before adding these to your dog’s diet just to make sure your staffy won’t have a negative reaction; it's always best to be on the safe side when changing a dog's dietary routine. For more suppement info, we have a full article on staffy health supplements. After a nice long walk, your staffy’s going to need a comfortable place to rest those joints and get ready for the next one. You can invest in an orthopedic bed that will soothe and provide comfort for your resting pup. If your staffy does experience joint pain, it will be very difficult for your staffy to sleep with it and this type of bed will make it much easier. In the end, it’s important to take all precautions against the possibility of joint pain because developing arthritis will be no fun for you or you dog. There you have it, all the tips you need to help ensure you dog's joints stay healthy and strong for life. Be sure to comment below if you have any tips of your own, I'd love to be able to add your experiences to this list!